We realize that a lot of Smallmouth fishermen/ fisherpersons either don’t have a good Smallmouth lake close by or prefer the quiet and solitude of a good wooded river or stream. We hope that the following is helpful and informative. While lake anglers seem to have more information about their body of water at their disposal than most river and stream anglers, here is the best possible source of a wide variety of information for your particular fishing area. It’s the USGS(United States Geological Survey) Water Resources for the United States web site. You can find out the current water flow for your river or stream plus the water quality and a host of other information. Their home page is at http://water.usgs.gov/. The specific information on each states water is under the Water Data heading or you can go directly to that page at http://water.usgs.gov/realtime.html. Before you venture out in into the river or stream of your choice you should try to determine what the water temperature is so you can plan your strategy for lure choices and retrieves. If you are unable to take along any type of thermometer the following should get you in the general vicinity of what the water temperature should be. Take the average high temperatures and the average low temperatures for the week add them together and divide by 2. 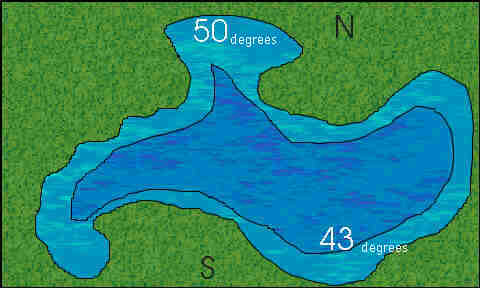 This should give you a pretty good idea of what the water temperature is. For example: if the average high temps for the week were 75 degrees and the average lows were 45 degrees that would give you a total of 120. Divide that by 2, and that gives you 60. The water temperature should be right around 60 degrees. Medium or Ultra light gear is the mainstay of the stream person while those who fish rivers can use heavier action equipment. Shimano, Zebco and Quantum are some of the more popular brands of reels among our River and Stream anglers. While the choice of a good rod depends on the size of the lure you’re using , Shakespeare has been mentioned a few times by some of our regulars. Falcon has also been recommended as a high quality rod. As for what line to use. Since using light line and rocks don’t exactly go together try using some of the new “Super” lines like Berkley’s Fireline. They have the diameter of 2 – 4 pound test but have the strength of 8 – 10 pound test. This of course depends on what pound test line that you choose. For lures you should generally scale down the size of the lures that you use and try to match the size of the baitfish of that particular river or stream. Don’t be afraid to go down to 1/16 ounce or lighter if you have to. Just balance your lures with the type of rod and reel that you are using so you can present your lures in a somewhat natural manner. Occasionally you may want to change to a larger lure if the smaller lures or the ones that you normally use don’t produce. This gives the Smallies something different to look at plus it gives them the impression of a larger meal to eat. 1. 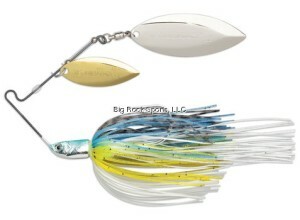 Three inch tube jig (natural shad colors in clear water and black or dark brown in stained water). 2. Three inch curly tailed grubs, like the Kalin 3 inch triple threat grub rigged on a Bulldog 1/8 ounce jighead. 3. Blakemore 1/16-ounce Road Runner maribou. 4. Hair jig and Uncle Josh leech or twin tail trailer. 5. Small Smithwick Suspending Rogue. 6. Rebel Pop R, Hedden Baby Torpedo, Zara PuppySpook. 7. Use the Berkley interlock small snaps for quick lure change and, no, they do not impede the action of the lure or weaken the knot to lure connection. Others prefer a 3 inch Power Grub on a 1/16 oz narrow jig head in pumkinseed or white if the water is muddy. Another good choice would be a 2 inch Sassy Shad on a 1/16 oz jig head. The Tiny Torpedo is a must have for river smallmouth anglers. For best results however, don’t fish it straight out of the box. Add a split ring to the line tie and to both hook hangers. This will give the torpedo more action and will allow the hooks to swing more freely…less thrown baits by mr. smallie. You should also doctor the spinner a little. Take it off and bend each blade a little more, like the prop on an airplane. Also make sure you sharpen the hooks or replace them with better quality ones. Regarding fishing techniques, The best presentation is some sort of stop-and-go retrieve, except for at night when a slow steady retrieve works the best. HERE ARE SOME TIPS AND TACTICS! If you are planning to some or a lot of wading, especially in the early Spring be extra careful where you put your feet! A wrong move could end your day (either temporarily or permanently!) There are some manufacturers that make felt soles for extra gripping on slippery rocks and gravel. If possible always cast upstream. This gives the bait a natural appearance or at least it will come from a direction that the bass are expecting. When you bring your lure by a fallen tree or a little pocket on the down side of a rock, the bass are expecting some type of food to go by and if you come along with a small jig or lure the bass will be expecting it and nail it before it gets by them. If you cast from the opposite direction you will bring it up behind them and just scare the livin’ scales off ’em! It’s always best to try to “match the hatch” as fly fishermen would say. If you are fly fishing for Smallies then that is probably what you would say. Generally you want to carry lures that match the size and color of the bait that is in the river or stream. However there are always exceptions to rules and this is one of them. While using small lures on good Smallie streams will generally produce tons of small bass try using lures that are a little larger than normal. This will usually weed out some of the smaller bass and produce more of the quality Smallies that your after. If you are fishing an area that has gotten a lot of rain over the past several days or longer and the water is muddy, you don’t have to stay home. If you can safely get out on the water use lures that are bright in color and make a little noise. Smallmouth bass have to eat and just because it’s muddy doesn’t mean they have to starve. When the water first gets muddy it will adversely affect them but after a couple of days they will sort of be used to the conditions and be looking (or actually hearing) for food. Use fluorescent colors of Rat-L-Trap type lures, jigs with rattles and white spinnerbaits. The key is to use a steady retrieve so the bass can home in on them. I have that “Erie” feeling again! WHOA!…..now THAT’S a good fish I thought as my rod doubled over. “Looks like you could use a little help” chuckled my friend and Great Lakes guide Nolan Edward’s. “Think you can handle that big girl all by yourself”? With a grin on my face that must have spoke volumes, I shook my head no. “I believe I can handle it”, I said. We shared a laugh between old friends that comes from the excitement and the accomplishment of the moment. This was a BIG smallmouth I had on, I had no doubt. I was gaining line , but for the most part this fish was having its way with me. It fought with a dogged determination that is so symbolic of this species, no aerial acrobatics , 44-degree water temperature had seen to that, just a steady heavy throb. Finally, after what seemed like an eternity of butterfly’s and white knuckles the fish began to give in, slowly at first, but with each turn of the handle it came a bit closer to the boat. There she was, I could see her now some fifteen feet down in the crystal clear water, jerking her head side to side in a last effort to rid herself of the hook. She was magnificent I thought to myself as Nolan slid the rubber net under her. I let out a sigh of relief and just stared in amazement at the size of this smallmouth I had just caught. The scales told the story eloquently 5 lbs.,2ozs., I was right, that WAS a big smallmouth. “Lake Erie” is far and away the best smallmouth lake in America, nothing else even comes close” stated Dan Surra of the In Fisherman Show and Magazine. “There are just so many four pound fish being caught it’s incredible, a five pounder rates but a brief mention here” he added. I can attest to the truth and wisdom of these statements for on this, my FIRST day , I caught and released 6 smallmouth over five pounds, and 2 that were over 6 pounds . Talk about being in the zone, man I was in the TWILIGHT ZONE. Great days such as the I one just described happen from time to time on this storied fishery. Thanks to the efforts of the New York State DEC, this outstanding fishery is there for all to sample and enjoy. Beginning in the spring of 1995 the eastern basin of Lake Erie was opened as a “Trophy Fishery” for smallmouth bass by the state with a creel limit of one fish per day over 14″. The season opens the first Saturday in May and coincides with the opening of the walleye season. The first few years there was little if any pressure, but in the past five years this area has become a hot bed of early season smallmouth fishing that has been sampled by fishermen throughout the country and Canada. With out a doubt my favorite time is the first week of the season. Over the period of the past five years our records indicate most of the smallmouth we have caught that were over 6 pounds were taken during this period. Memorial Day weekend will coincide with some of the very best action you will ever find. This in my opinion , will offer you the best shot at finding that proverbial “Pot Of Gold”, and striking it rich with one of those 100 fish days. The action from June to mid July is still quite good, but with less of the really large fish being caught. Mid July through the end of August the action slows somewhat, but can still be quite rewarding. September through October can be some of the best fishing of the year and would be my second choice as “Best Bet” . The numbers and the size pick up as the “attack formations” of marauding smallmouth put on the fall feed bag. The action at this time can literally be non-stop and the fight these hefty Bronzebacks put up can make one pause to wonder what type of heart medication may be available. Few other fresh water fish rival their aerial acrobatics during the fall. Just try keeping them in the water. Our “home base” so to speak is Dunkirk, New York. Located some thirty odd miles from Buffalo, New York. Lodging and meals are readily available in the area. My recommendation would be the Roadway Inn, which is located less than a ½ mile from the State Launch on Rt#5 . For accommodations call (716)366-2200. There are a “bevy” of fast food “joints” in the immediate area for those thrifty minded individuals and a service station and mini-mart directly across from the ramp that’s open 24 hours. My personal preference is the grub, but tube baits and many other offerings will get the job done. I like the “Bobby Garland” hyper tail grubs in the following colors. 1) Mossy Green/Black Flake 2.) Avocado 3) Pumpkin/Green Flake. For tube fishing my preferences are the “Bobby Garland” Gitzit in the following colors 1) Green Craw 2) Pumpkin/Chartreuse 3) Smoke/Chart Red Flake. The predominant forage species is the Emerald Shiner and for that reason I really like the green hues. Just about anything you usually use to catch smallmouth on your home water will work here. You should have a large assortment of lead heads ranging from 1/16 to 3/8 ozs, these will fit all the situations you may encounter. I have three rods set up at all times with a different size jig head on each. This allows me to quickly adapt to whatever the situation dictates. I prefer a Daiwa 6’10″ finesse spinning outfit paired with a Team Daiwa 1300 spinning reel spooled with 8 lb Berkley Trilene XL (Green). I would not recommend using a rod shorter than 6’6″. Much of the fishing we do is drifting over structure breaks in depths ranging from 18 to 40 feet in the early spring and the longer rod lends itself more readily for that job. Any quality rod and reel will handle the job nicely. 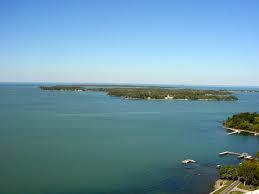 The main draw back to fishing Lake Erie in the early spring is the weather. Fronts are constantly moving through the area and conditions change almost hourly. If you plan to go for five days, you may be lucky to get out only twice. But most time’s two days is enough. Remember that this is a very large body of water that can get “nasty” real quick. Give her the respect she deserves. Remember , discretion is the better part of valor. Have a ball and hold on! Since the terminology from North to South is very different, it would be better to describe the basic language in this article at the beginning to help end some of the confusion. A Float-N-Fly rod can be almost any rod that is about 8’ long to about 12’ long. I have used about every rod you can think of, from the long European Match Rods, Downrigger Rods, Noodle Rods, Crappie Rods and so on. I have settled on a Browning STS90N, which is a 9’ rod made of IM6 graphite and is what a fly fisherman would call a full flex rod, because it bends equally over the length of the rod. With the 9’ rod I use bobber to jig lengths 7 to 11 feet. If I have to fish deeper I go to 12’ graphite Crappie Rod that has good backbone and use bobber to jig lengths up to 15 feet. A fly, any where in the country except in the south is hair, feathers, or synthetic material tied to a hook and fished most of the time on a fly rod. In the south a fly is a lead head jig that has hair, feathers or synthetic material tied to it. Simply called a hair jig any place else. Many, many people have tried to copy the fly that is made by Bullet Lures in Jonesborough, TN. (423-753-6151), but this fly took years and years to develop. It is made to resemble the young shad that die during a cold winter. Charlie and his brother Eddie, who now run the company, have found the secret to make the jig look real. If you hold their jig perfectly still in the water, it has the shape of a small shad. Most of the baits made to copy Eddie’s bait looks like a spider in the water. A float in this case is nothing more then a 7/8 or 1-inch pear shaped bobber. Some people have made changes, but this is the original set up. The original set up is to use a spinning reel loaded with 4 lb test that you start out by tying a 1/16 or 1/8 lead head jig, dressed with craft hair, to the end of your line. Then you move toward the rod tip 7 to 9 feet and take your bobber and only use the bottom end of the brass hook to attach your line. You take your 4 lb line and wrap it around the brass hook of the bobber 3 times. This makes your bobber stationary, but you must remember to tie often and also tie after every big fish. This is the original set up and is extremely affective, but when you guide and have people that don’t fish often, there are several changes you can make to save some headaches. When I guide I usually either jump up to 6 lb, test or use Fireline that is 14-6. I take a small 3-way swivel and tie my Fireline to the top eye. Since I am also a fly fisherman, I then take a tapered leader the length I need and tie that to the bottom eye. The tapered leader makes it much easier for new people to cast this rig. The third eye of the three-way swivel is where you hook the bobber. This saves a lot of broken lines and lost equipment. Before I get into the real meat of this article, allow me to tell you how I learned of this method and how this whole thing got started. Sometime in the early 90’s, a great fellow, the late Charlie Nuckols, phoned me from east Tennessee and said, “I hear you know where those big Smallies are located on Dale Hollow Lake in the winter. I have a new way to catch those big Smallies in the winter when the water gets extremely cold and they get hard to catch”. To make a long story short, he came and showed myself and one of the best outdoor writers in the country, Don Wirth, how to use his new method and the rest is history. This is a winter method in the South and could be considered a fall and spring method in the north. Almost every year at Dale Hollow Lake, we get a very hard freeze during the first or second week of Dec. that will drop the water temperature below 50 degrees. This hard freeze will stun the shad and cause them to start dying and most of the game fish will move under these big schools of shad for an easy meal. Each cold spell after that will cause the shad to group up in larger and larger schools and by Jan. and Feb. they are dying by the thousands. I will start using the Float-N-Fly shortly after that cold snap and will quit as soon as the water starts to warm again. That’s usually some time in late Feb. or early March. I’m a big lure big fish man and when I can I throw crankbaits, jerkbaits, and spinnerbaits, however, lots of guides stay with the Float-N-Fly method well into the spring. The best place to start looking for these large schools of shad are in the little creeks and bays of the large creek arms. I usually drive around in the creeks, watching my Lowrance to get an idea of where the bait is located. When you find the bait in one creek, it will usually be in similar areas in the other creeks. Most of the time the bait will be located on fast drop off areas and most of your fishing will take place with your boat in fifty feet or more of water. You’re fishing for suspended fish so don’t worry that your bait is only 9 to 15 feet deep in 50 or 60 feet of water. Another reason that makes this method so effective at Dale Hollow is because the water is so clear. When vertical jigging spoons, I have actually seen Smallmouth and Spotted Bass come off the bottom in 40 feet of water to hit the spoon that is 15 or 20 feet deep. It gives you a lot of confidence to know that a fish will move that far to hit your bait. If you have ever thrown a Carolina Rig, you will be in the ballpark making your first cast with a Float-N-Fly. You’re not trying to put your bait 6 inches from a stump or log, because most of the time you’re throwing to open water. As long as you’re hitting in the general area of the schools of shad, you’ll be in great shape. After you make your cast, wait for around 20 to 30 seconds for your bait to sink and suspend under the bobber. 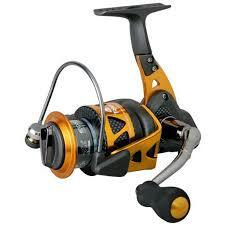 Start shaking or quivering your rod back and forth as you very slowly turn the reel handle. After 3 or 4 turns of the reel handle, stop and allow the jig to flutter back down under the bobber. Repeat this method until it gets back to the boat. At the same time your bobber is getting to the boat, open the bail and in one motion swing the bait back over your head, and as you hear the bait hit the water behind you, make your forward cast again. 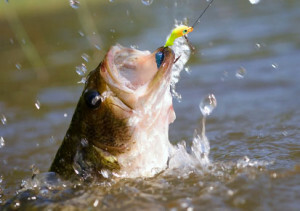 A hit can be so hard, that it sets the hook itself or so light that the bobber will just make little circles on the water. When they just barely tap your bait, stay patient and it will usually come back and take it hard. Play your fish easy, but remember that a long soft rod will give you a lot of help and is very forgiving. I don’t like a net, but I recently purchased one of the new rubber, shallow nets, because the fish are so hard to land by hand with all that line hanging below the bobber. Just because you’re fishing a very slow deliberate method, don’t think you’re stuck in one area. You’re not going to cover the same amount of water as you do while running and gunning while throwing crankbaits, but you want to try as many areas as you can to come up with a pattern. Fish steep banks, pockets, bays, humps, roadbeds, etc., until you find where they are, and concentrate your efforts on similar areas. It doesn’t matter whether you’re fishing the Float-N-Fly or throwing crankbaits, Smallmouth love that bad nasty weather and it seems it can’t get too nasty. Having that clear blue bird sky and you will have a hard time, just as with any other bait. This is like any other bait, you have to go out and fish it until you get confidence and then it is hard to put down.